I have been having this same problem for the past couple of months. It has gotten worse recently which lead me to this thread. After realizing what was causing the problem I called Dell's support line. I purchased in Oct 2015 so I am out of warranty. 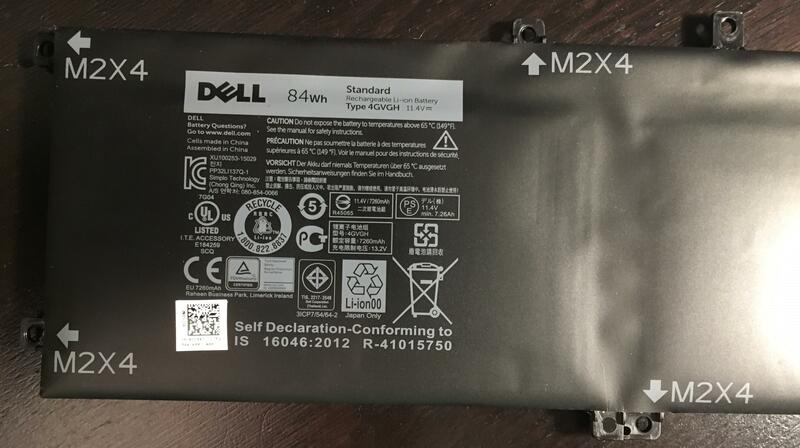 I had purchased a new replacement battery ($139) for my XPS 15 9550 which they shipped right away and I received in 2 days. Unfortunately after disassembling I find out that the wrong battery had been sent to me. After calling back and spending at least an hour on the phone they inform me that there are no new batteries for the 9550. My only option is to ship them my laptop and have a refurbished battery installed. This is not an option for me because this is my only computer currently (software developer). I'm not quite sure why they can mail me a new battery but not a refurbished one. They said they have no idea when a new battery will be available for me to purchase. Now I am left with the following options. 1) Order a replacement battery from ebay or some other place that I'm not 100% I can trust or 2) Risk continuing to use my laptop with this battery swelling inside of it and possibly permanently doing damage to the laptop or worse it leaking/exploding. If anyone has a good recommendation of where to purchase a replacement battery for the XPS 15 9550 please let me know. -- if this is a preexisting problem with the battery manufacturer anyway (or if there's no cavity space in the battery housing, ie. inherent design flaw), then a brand new one will just as well start becoming swollen after a year as well no? I had a big decision whether to buy the XPS 15 9550 or the Surface Pro 4. I'm really regretting my decision. I've had nothing but problems with the XPS since the beginning. A whole year of headaches with the TB15 docking station, the thunderbolt 3 port, and wireless card issues. They were mostly solved finally right before my warranty ended. I thought I was in the clear. Now, I'm having the exact same problem. My touchpad is lifted and the lid won't shut. I've had my laptop docked and haven't touched it in a month. I was packing it up to take on a trip and then noticed the touchpad. My warranty ended a month ago. The headaches continue. I sent a message to support and they can't help me anymore. I have to call the out of warranty people. With all the issues this piece of garbage has given me, now I have to throw more money into it? This is a pretty big flaw in the design and I'm not happy I have to foot the bill for something that's obviously a common issue. "This swollen battery doesn't happen on Dell only, other computer manufacturers have this issue too and this is not limited to laptop, even mobile phones battery have this issue too. This issue has nothing to do with the system model, this is an issue with the battery, if you search online, this is the cause why it swells, "Bulging batteries mean only one thing- buildup of gas inside. The gases are produced due to electrochemical oxidation of the electrolyte. Such oxidation occurs usually due to overcharging of the battery due to a faulty battery, or faulty charging electron." We paid for what is supposed to be a premium product but even my old entry level Acer from my college days can do better? Come on. Since I did not want to deal with Dell Support, I went ahead and ordered a new battery from Amazon. Since I have the larger battery, there is no hard drive. I'm having the exact same issue as described above. My laptop is barely 1 month out of warranty (purchased December 2015). I've had this problem for a few months now, and tried to ignore it, but only in the last few weeks did it start to become unbearable. Dell support claimed about this forum: "the link you have just shared with me is a link of Dell forum where anyone can share his/her views. But the issue which you are report is not a known issue. So we can surely help you in this regards however as the system is out of warranty." It seems that by looking here, a number of users have this issue. I wanted to send my laptop in for repair, however the support specialist indicated that parts won't be available for the next 15-20 days and to check back then, which I plan to do. Will Dell formally recognize this as a manufacturing defect, and issue a recall, and free repair? I will be initiating a formal complaint with an agency. Dell has repeatedly refused to recognize a manufacturing defect that multiple users are experiencing. Hopefully everyone here can have their machines fixed as a result. Hello, I started having the same problem. The Touchpad's "click" became progressively worse and the pad eventually started to physically pop out of the frame. Like the other poster I didn't want to deal with Dell Support*, the shipping and packaging cost, and ended up buying a replacement battery on my own. That fixed it instantly. * NOTE: My observation was that the swelling of the battery would pucker up if the laptop was unplugged, turned off and stored at cool room temperatures for a few hours. Basically a scenario that reassembles the situation if I had sent it in and I had low confidence in getting it fixed. Dell Support: Escalate this to an actual Engineer who'll connect the dots and realize that there's an actual problem. Have same issue. From doing research seems to be a common problem. Definitely battery as I decided to leave unplugged for awhile and it decreased. The trackpad is still hassle to use so replacing battery is best fix. Doing a battery report in windows gave weird results too. Seems its getting charged to 147%. Since i have 0 faith in Dell support as many others here i just ordered a new battery. In the meantime to keep from getting worse make sure you go into bios and set the limit to 55% for max charge. Same thing is happening to my 9550. Called in for support, they said it's out of warranty, so there'll be a charge. Of course, it's 6 days out of warranty. Not even a week. "You won't be able to extend the warranty since there's now an open issue with the laptop"
I really hope that's not true or this will probably be the last Dell I buy... Razer makes a fine laptop, and I hear they have really great customer support.